If an EX Series switch receives unwanted Network Time Protocol (NTP) requests, it will be too busy to serve them. The NTP and Software Forwarding Infrastructure Daemon (SFID) processes will use too many resources, which could result in protocol flaps. This article describes the technical background, the symptoms, and the proper filter rule for the EX Series (except the EX9200). An EX Series switch receives unwanted NTP requests, which could result in protocol flaps. The NTP server in UNIX and Linux supports the monlist request feature. With this feature, you can request the NTP client list that the NTP server is serving. Recent versions of the NTP server only support this request from localhost. 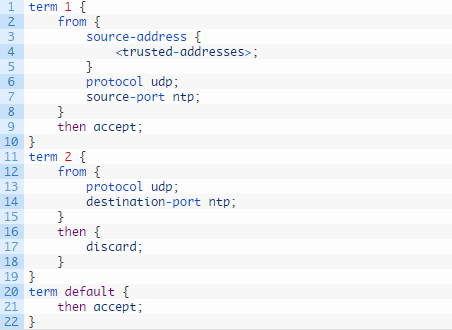 However, older versions of the NTP server allow this request not only from localhost but also from the remote client. This is an evolved form of DDoS attack, using an NTP feature without zombie. 1. The lo0 filter of EX does not cover the me0/vme interface. If the me0/vme is configured and used, the filter must be configured for me0/vme as well. 2. The lo0 filter does not affect communication between lo0 and lo0. However, the EX Series (except EX9200) works differently from the other platforms. There was no problem when tested in EX8208 with 11.4R8.5 and 12.3R4.6, even without any accept rule for the IP address of the lo0 interface for the lo0 filter. The lo0 filter mechanism of the EX Series is different from that of the other platforms. 3. The EX Series does not support the port matching condition. EX CLI allows the port matching condition entered in the firewall filter as a hidden command but it does not work. This confuses operators. In many cases, however, switch operators prefer to use the command show | display set, which does not show the warning. Add these firewall filter terms to the lo0 interface filter and also to the me0/vme interface filter, if it is configured. Thus the above firewall filter will not be necessary in the future, but for now, it is mandatory in case switches have a public IP address.